Strange clicky sounds are picked up via undersea microphones about the time Nelson saunters into the control room waxing about a mariner's tale from an ancient book that tells of similar sounds being heard before a British fleet was sent to the bottom years before--and right in the same area. Quite a sentence, huh? Well, that's the set up for a story in which Seaview soon winds up on the bottom, the victim of abrupt underwater turbulence. While repairs are effected, more clicky sounds are heard, and finally a strange rock man is seen through the observation ports. 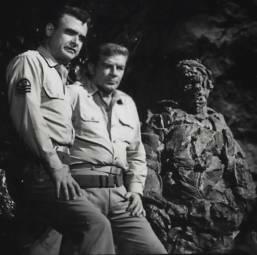 A diving party is sent out to investigate (Kowalski and Richards) but after further turbulence, only Kowalski returns. Strange clicky sounds draw Crane and Nelson's attention to the observation ports. in a "plan" to use Seaview to "take over the world." Nelson and Sharkey escape and make it back to the sub. Wren and some rock men get aboard Seaview. Wren joins Richards, who is becoming a fossil man himself. The two lock themselves in the missile room and prepare a nuke for firing at the US (having forgotten about Failsafe -- or maybe it was the writers who forgot.) Anyway, concurrent with all this, Nelson has hauled a nifty sonic device out of the lab, and Sharkey has reduced some of the Rock Men to gravel. Nelson, Kowalski and Sharkey manage to blast their way into the missile room, prevent the firing and reduce Wren to gravel as well. End of song. Thank you. James N. Whiton: "I pitched three spy stories to the producers and they shot them all down. They said they were no longer interested in spy material and that they wanted monsters. As I stood outside the studio, I saw rocks in a near-by park and wondered what would happen if they suddenly came alive? I jotted down the idea for a story on the back of an envelope and when I pitched it to the Voyage people over the phone the next day, I got the script assignment." 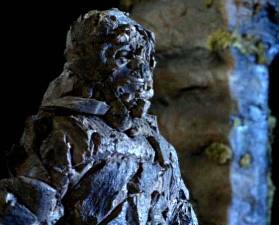 Mark Says: This is a fun episode, with lumbering rock men costumes that look great. Some scenes are definitely played for laughs, especially when Nelson and Sharkey converse with Capt. Jacob Wren in the grotto. A silly adventure but lots of action. Mike Says: Yes, silly. Writer James Whiton's comments above are most telling regarding the mentality to which the writing had devolved by Voyage's third season. It's not that the writers didn't have ideas, it was more that, in general, the producers didn't want more complex stories. 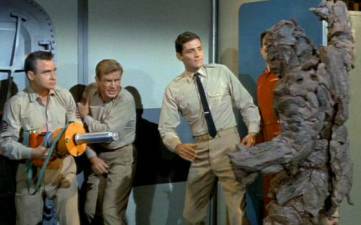 When non-fans remember Voyage, they remember seasons three and four and the monster-of-the-week shows. Which is why Voyage never became a franchise. Too bad, it had as much, if not more potential than Star Trek (IMO). It certainly had a brilliant cast that could deliver real drama in addition to the action, if only they'd been served more completely developed scripts.